Production bats are simple things, really, no more than circles of wood or plastic that sit between your wheelhead and your clay. They're simple but necessary: bats enable you to quickly and easily remove your work from the wheel. Put a fresh bat on your wheel, and you're ready to throw again. These bats all have holes for batpins spaced 10 inches apart, which is standard for all new wheels. Please let us know if your wheel has different spacing for the batpins. 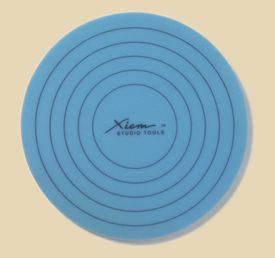 Xiem Studio Tools innovative peel-and-stick self-adhesive foam trimming bat is ideal for trimming large bowls and plates without the use of a coil to attach the piece to the wheel head. The foam bat sticks firmly to all types of 14 wood and plastic bats. Once applied to the bat, its surface grips the rims of leather hard pieces and holds them in place for trimming. Items can be easily centered using the concentric rings. Save yourself from broken tools, torn fingernails, and general aggravation with the Bat Lifter. Just slide the tip between the bat and wheelhead to easily lever and remove any sticky bat or heavy wheelthrown work. Batmates are the perfect solution to problems with warped bats or bats that jitter on your wheel. Soak the Batmate in water, wring out the excess, lay the Batmate on your wheelhead, and put the bat on top. Voila! Rinse off any clay buildup after use, dry it, and store it clean (no clay). 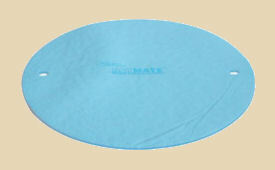 If the Batmate becomes stiff, soak it in water again and it will return to its original shape. 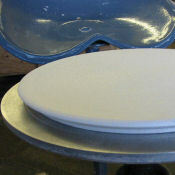 Available in 12" and 14" sizes. Welded support rails offer added strength and stability and side frames include holes to adjust the top two rails for holding larger diameter bats (see inset photos above). 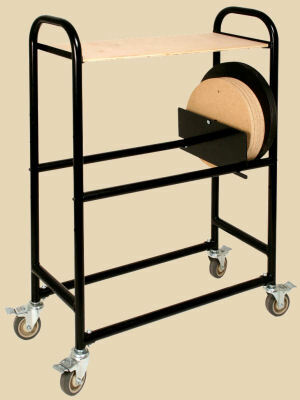 This strong steel cart glides on 4" diameter rubber swivel casters and is a great place to store your unused bats. Once in place the casters can be locked to prevent rolling. It holds up to 90 - 14" bats, with adjustable shelves for almost any size bat and a top shelf that can be used on a ware cart. And to keep them securely in place, the Batmobile includes the Brent BatBrace (see photo). Acting like a "bookend", the BatBrace keeps up to 50 12" or 14" Plasti-bats from sliding. BatBrace also sold individually if more than one is desired, click here for more information. Dimensions 42"w by 35"h by 14"d.
Plasti-Bats were designed by studio potters to be versatile, long-lasting, and practically indestructible. 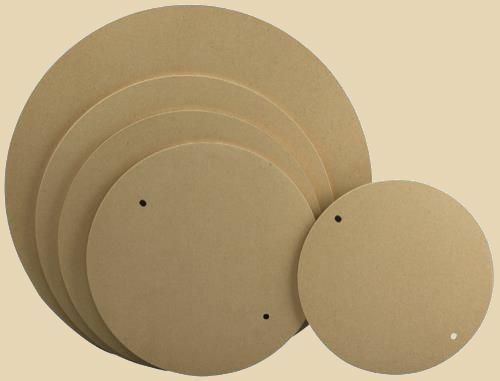 Made of rigid high-impact plastic, they will not shrink, splinter, delaminate or swell even in continuous use. They're easy to clean, and impervious to water and most chemicals. 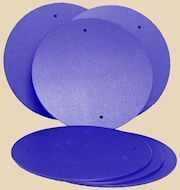 The surface is a non-absorbent, positive adherence surface that does not allow clay to slide or turn loose while centering. All that, and they're lightweight and easy to carry, stack or store, too. Creative Industries' trademarked "Easy Lift Rim" makes it easy to remove the bat from the wheelhead in one smooth motion without disturbing, rocking or tipping your new work. These injection-molded plastic bats are easy to maintain and long-lasting in use, while holding their original shape and size. As an additional feature, their unique "bat ribs" easily grab onto clay rings for throwing on wheel heads without bat pins. These popular, smaller square bats save room on your studio shelves (or on your ware carts) so you can use the space more efficiently to store more pieces. They offer the same features as the larger Creative Industries bats. Performance similar to plaster bats. No need to cut your pieces off with wire or string: when the clay is leather hard, it just separates from the bat. Drilled for standard bat pins, but not drilled through: there are no holes in the surface. Waterproof sealed wood product does not swell when wet. Wonder Bats are made with a moisture-resistant formaldehyde-free treated wood composite developed for applications in exterior and high moisture interior environments. It has a uniform density and thickness compared to raw wood: the consistent physical properties throughout the board make it resist warping. And no old-growth timber goes into Wonder Bats! They're made solely from wood chips and sawmill byproducts. 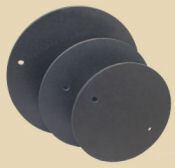 NorthStar has discontinued their wheel bats made of Duron and Masonite in favor of Medex. A 3/8-inch Medex bat 18" wide can support up to 350 pounds of clay! 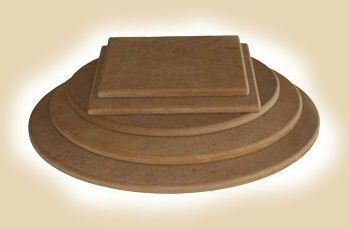 Medex also will not degrade like particle board. They are more expensive, but they are PERMANENT. We offer NorthStar's Medex bats in two thicknesses, 1/4" and 3/8" inch. Other bat sizes are available by special order. HDPE (Blue) Plastic Bats are 3/8 inch thick, matte finish on both sides to hold and release clay more easily. Standard drill is two holes 10 inch center-to-center to fit Brent, new Pacificia, Soldner and many others. NorthStar Plastic Bat - 13 x 3/8"
NorthStar Plastic Bat - 15 x 3/8"
NorthStar's Universal Bat System saves a great amount of shelf space when making pieces with small footprints. The outer bat is Medex, 1/2" thick and 13" wide, and the inserts are 1/4" Duron which sit 1/8" above the outer bat. 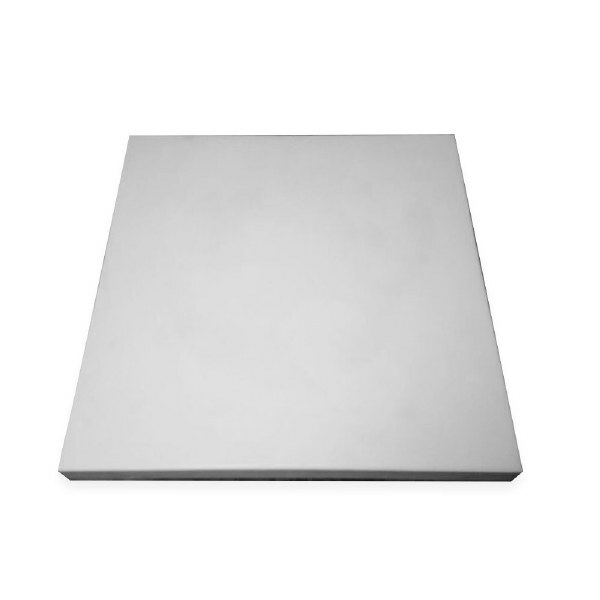 **We are looking into the size discrepancy with Northstar** The inserts measure 5-1/2" square. Inserts remove easily from the outer bat, yet fit snugly enough that the cavity stays clean. When you finish each piece, lift out the bat insert, plug in the next one, and you're ready to continue your production work. The outer bat and bat inserts are sold separately as listed below. 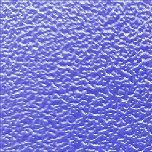 Hydrobats are made of gypsum cement ten times stronger than conventional plaster, but with a similar water absorption rate. 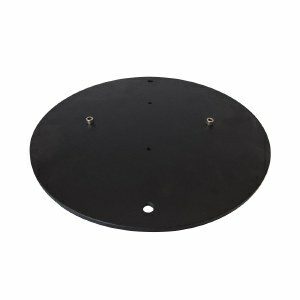 Two hard rubber grommets in the bottom assure snug fits on wheels with standard (10") pin spacing. Larger and smaller sizes of Hydrobats are available: please call or email us for more information. Hydro-Bat Adapter is designed to use 8.5" and 10" Hydrobats that are too small to fit on regular wheelhead bat pins that are spaced 10" apart. The adapter is made of a sturdy polyethelene plastic with drilled holes to fit on standard wheel heads. 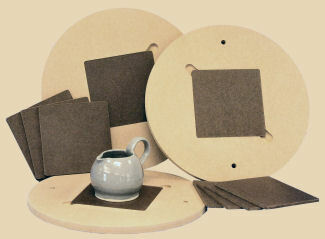 Great for making multiples of small items like cups and bowls. Plaster Drying Bats are an important part of the process if you reclaim clay from slurry, scraps, or "oops" moments on the wheel. You can also use them to dry your work with less chance of cracking at the bases. With reasonable care, these drying bats can last for several years of use. Both bats give you lots of working room and are sized to fit most projects. G099 • $25.00 - 17" x 14" x 2.5"
G0100 • $89.00 - 21" x 27" x 3"